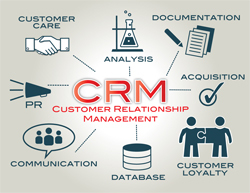 A customer relationship management (CRM) system can not only help you form and maintain strong relationships with your clients, but it can also streamline your office procedures and boost efficiency. Not quite convinced? Here's a fictional example of why all financial advisors need a CRM system. James and Betty are two of your favorite clients. They have been with you for a long time, and you have learned about their children and the three golden retrievers that they rescued and treat even better than their kids! With 200 other clients, though, it's nearly impossible to remember the important details of every phone call, not to mention that this February marks their 10th year with your practice. Even if you could remember all of these details, your staff doesn't necessarily have that familiarity, nor will your successor. James and Betty really appreciate the personal, familiar touches, so it's very important that the firm wishes them a happy 25th wedding anniversary this June and sends a note of congratulations to their oldest daughter, who will graduate from Stanford next May (and ultimately inherit half of their assets). How can you ensure that all of this gets done? A robust CRM system can help you organize and remember these key details for all of your clients, as well as anyone else who is important to your business, including prospects, vendors, centers of influence, and even personal contacts. Let's take a closer look at how CRM systems have evolved to help ease four major struggles that every financial planner faces. Maintaining schedules can be a chore, especially if you are trying to maintain more than one. Financial advisors need a CRM system so that the office has one common place where everyone can see what's on tap for the day. With a good CRM, it doesn't matter where or how you enter new appointments—from your mobile phone, tablet, Outlook, or the web—everything is available to you and your office in real time. The minute your staff books an appointment, it's available on your iPhone calendar so that you don't accidentally double book. A good CRM will also proactively remind you when it's time to reach out to a client to touch base or schedule the next client review. You learn something new about your clients during each and every interaction. The CRM is the perfect place to document what decisions have been made, what actions have been taken, and what is still left to do. When properly organized, it can make prepping for your next review easy. When it's time for your client's yearly review, a good CRM will provide you with a concise report summarizing your previous notes. These reports can be filtered for specific accounts discussed or any keywords your office uses. Remembering the important details about clients makes them feel special—and it could even increase the number of referrals that they send your way. When leveraged well, CRM will remind you to send them a gift on their birthday, a card on their wedding anniversary, a thank-you package on their 10th client anniversary, and any other type of special acknowledgment. Organizing connections. CRM will help you keep track of which clients are friends, family, coworkers, or even referrals. It will also give you a place to easily see that 15 of your clients are working with a CPA, which puts you in a good position to turn that CPA into a strategic referral source. Automating processes. Just about every office has a routine that accompanies the onboarding of a new client. Somebody has to set the new client up in CRM, send a welcome basket, and call him or her to set up a first appointment. These steps are predictable and nearly always done by specific people in the office. With CRM, you can create a template for this onboarding process, so that every time you bring in a new client, the appropriate tasks will be distributed automatically to your staff. Tracking e-mails. More and more, e-mail is becoming the preferred method of daily communication. The moment a new e-mail comes into your inbox, a good CRM can figure out the sender (based on the e-mail address) and add it to that client's history—even before you open the message! This will give you the flexibility to read e-mails from any device, delete or archive them, and know that a copy resides in CRM, so you and your coworkers can review it at any time. Tailoring and streamlining communication. CRM allows you to customize your communication on a large scale. Using clients' nicknames and attributes about them (e.g., "retiree" or "nervous about volatility"), you can quickly and easily communicate a tailored message to those who fit a given communication. Your clients will receive just the right message from you, and you don't have to send out individual e-mails. Once you start using a CRM system, you'll wonder how you ever survived without one. You'll find it invaluable to have immediate access to client information—such as James and Betty's past financial decisions, lake house phone number, or the fact that he likes to drink Diet Pepsi during review meetings. Workflow and rolodex data simply do not give a financial advisor enough information to manage client relationships. Advisors need to have that information interact with operations to be as efficient as possible. . . . Placing trades, rebalancing accounts, uploading documents, generating cash and money movement, updating books and records in bulk, changing periodic investments/withdrawals, and integrating with third-party financial planning or proposal software are just a few examples of where information and operations cross over and integrate in a financial advisor's business. Commonwealth has evolved our offering to create a total client management system—including our own custom-built CRM system—that integrates information and operations to optimize the entire technology experience for financial advisors and their clients. Learn more about what it can do for you with this free download. How do you use your CRM system? Share any powerful ways that it adds value to your firm by commenting below!